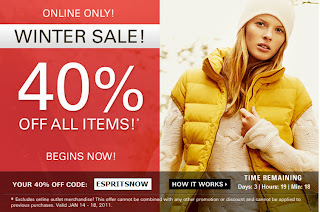 Enjoy 40% Off All Items at Esprit during their Online Winter Sale! The sale is available until Tuesday, January 18, 2011. Enter the discount promo code “ESPRITSNOW” at checkout to get the discount. This sale is available online only. Click here to shop Esprit Canada now. Gap Canada just sent me an email about this sale. 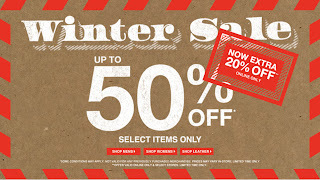 They have a 4 Days Only Online Exclusive Sale starting today until January 17, 2011. 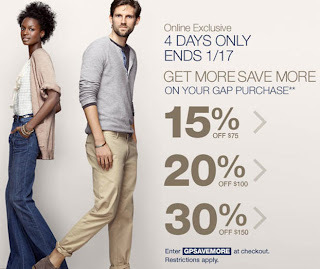 During this sale, the more that you spend, the more that you’ll save on your Gap Purchase. Enter the discount promo code “GPSAVEMORE” at checkout. Offer valid from January 14, 2011 at 12:00 am ET through January 17, 2010 at 11:59 pm ET. Offer valid in Canada only on Gap merchandise online only. Not valid at Gap, Gap Factory and Gap Generation stores. Not valid on international purchases. Qualifying amount applies to merchandise only, not value of gift cards purchased, packaging, applicable taxes or shipping & handling charges. Offer limited to one-time use only. Cannot be combined with any other offers or discounts including Gap Inc. employee discount. Offer is nontransferable and not valid for cash or cash equivalent. No adjustments on previous purchases. Offer subject to change without notice. Click here to shop Gap Canada now! 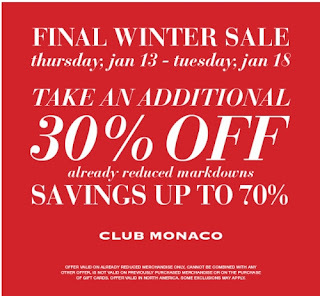 Club Monaco’s Final Winter Sale goes from Thursday, Jan 13- Tuesday, Jan 18. During the sale, you can take an additional 30% Off already reduced markdowns. This adds up to a savings of up to 70% Off on select items. This offer is only valid on already reduced merchandise only and is available at all Club Monaco stores in North America. Click here to visit Club Monaco’s website to find the store nearest you. 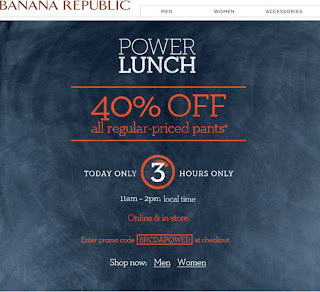 Banana Republic sent me an email this morning notifying me that you have another 3-Hours Only Power Lunch promo today. From 11am – 2pm local time today, you can save 40% Off all regular-priced pants. The sale is available online and in-tore. If you’re shopping online, enter the discount promo code “BRCDAPOWER” at checkout. Banana Republic offers free shipping on all orders of $50 or more. 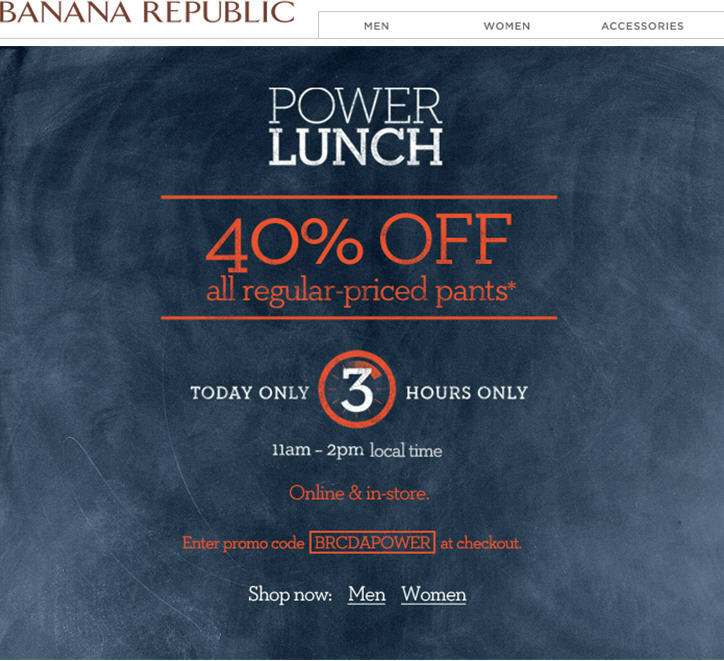 Click here to shop Banana Republic online. Click here to subscribe to the BP Buzz and get the free printable coupon as well as receive unique offers and the latest news from Boston Pizza. Note: After you sign-up, I got the email from BP right away, but it was directed to my SPAM mail. So check your SPAM folder if you don’t see it in your inbox right away. For a limited time, get an extra 30% Off All Reduced Boots at ALDO. This sale is available online and in-stores. You can also get an extra 30% Off All Online Clearance Items. I just checked their website and there is a very large selection of boots and clearance items to pick from. If you’re shopping online, ALDO offers Free Shipping on all orders over $75 or more. They also offer free returns by mail or to any Aldo store. Click here to shop ALDO Canada now or for more details about this sale. Petcetera just released a nice discount coupon where you can get $20 Off if you spend $60 or more. The coupon is available from Tuesday, January 11th to Friday, January 14th, 2011. 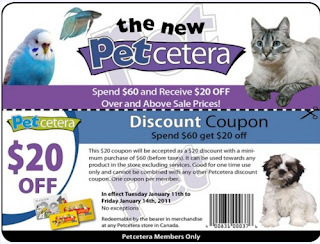 The coupon is available for Petcetera Members only, but it’s free and you can just sign up for the membership when you checkout at the store. The coupon used to be $20 Off when you spend $50 or more. It looks like they just increased it to $60, but it’s still a pretty good deal. 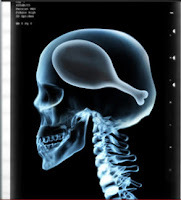 Click here to print out the Petcetera $20 Off discount coupon. 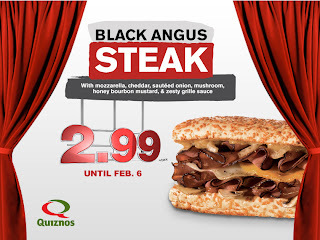 From now until February 6, 2011, Quiznos Canada will sell the Black Angus Steak 6 Inch Sandwich for only $2.99 plus tax. The Black Angus Steak Sandwich is made with mozzarella cheddar, sauteed onion, mushrooms, honey bourbon mustard and zesty grille sauce. This deal should be available at all Quiznos locations in Canada. Click here to visit Quiznos Canada’s website for more information about this deal. 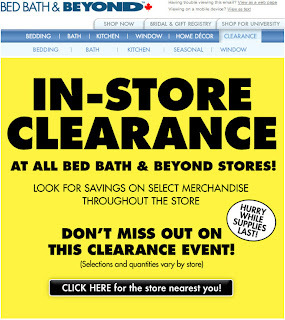 Bed Bath & Beyond just sent me an email telling me about their current In-Store Clearance at all stores! Look for incredible savings on select merchandise throughout the store while supplies last! Don’t miss out on this clearance event (Selections and quantities vary by store)! Click here to find the Bed Bath and Beyond store nearest you! Abercrombie & Fitch currently has a Save up to 50% Off Sale. This is a limited time only sale and is available in-store and online. The sale excludes fragrance, gift cards and select stlyes. The online list price reflects discounts. Click here to visit Abercrombie & Fitch’s website to start shopping now or for more information about the sale. If the ‘Save up to 50% Off’ Roots Canada Winter Sale that I posted about last week wasn’t good enough, you can now save an extra 20% Off when you shop online only on select items. Visit French Connection’s (FCUK) Canada website and enter the discount promo code “DRS25” to take an additional 25% Off Sale Dresses. This promo is available online only and starts now until January 31, 2011. Click here to shop French Connection now or for more information about this sale.